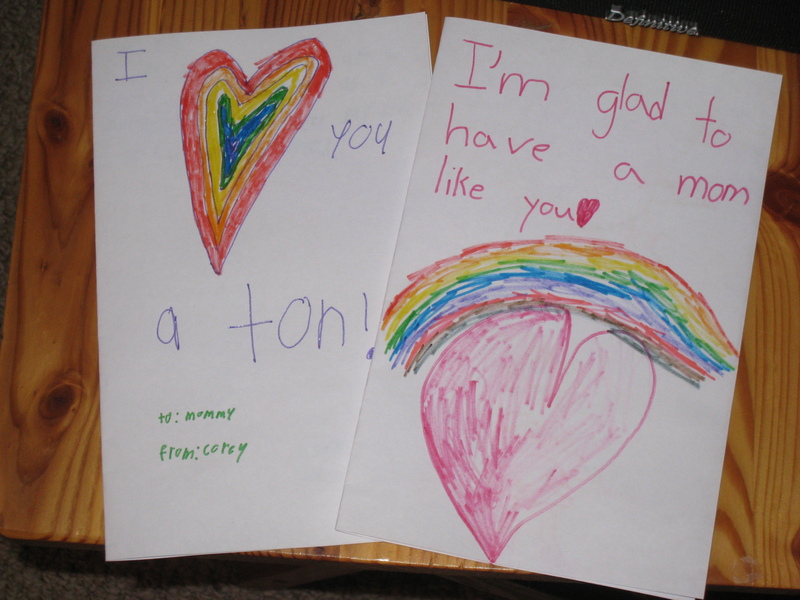 My babies made these sweet cards for me to wish me a “Happy Mother’s Day.” Corey’s said, “I am so lucky to have you as a mother. Without you my life would be ruined.” Wow. Ruined? Thanks kid. No pressure or anything. Mason drew a picture of me wearing high-heeled purple boots – seriously fashion forward – and made sure I knew that, should it come to a choice between me and his American Girl Doll, he’d pick me. I’m not sure what happens to the one of us who doesn’t get chosen in this scenario, but I’m guessing it’s nothing good. We’ve recently read about Whoville being boiled in hot beezlenut oil in Horton Hears a Who, so maybe that’s a possibility in his mind. To celebrate Mother’s Day, we took the boys to Fort Smallwood, which is a lovely park located on the water in Pasadena. The park features a path along the water, tiny beaches, a nice playground, picnic areas, fishing opportunities, and a bunker. So of course the boys climbed the bunker and tried unsuccessfully to break some bones and land us in the ER. And they were less interested in the beautiful scenery than they were in digging up bricks that had been buried in the sand on the small beaches. That’s the memento we brought home for the day. An old brick. We also put together a 400-piece puzzle as a family. Corey was actually really good at the puzzle, though Mason was just in the way in true little brother fashion. Corey made up a song about him at one point that included lines like this, sung in his sweetest little voice, “Little brothers, I wish they’d go play in traffic.” I’m happy to report that nobody was hit by a car during the puzzle construction, and we were able to successfully complete it. Now Corey has moved on to a 1000-piece puzzle, because what the hell? Go big or go home. We capped the day by watching Glenn Close play Cruella DeVille in “101 Dalmatians.” The kids loved it. I loved the peace of family movie afternoon. We ate dinner on the deck and enjoyed the gorgeous weather, put the boys to bed, and watched zombies try to eat people. I like zombies. They’re single-minded and predictable. I’ve found that it’s hard to eat a sundae while watching a zombie show, but not harder than refereeing my two wonderful children. The heart child hit a huge milestone on 4/21/14. The date marked the 5th anniversary of his last open-heart surgery, the Fontan. 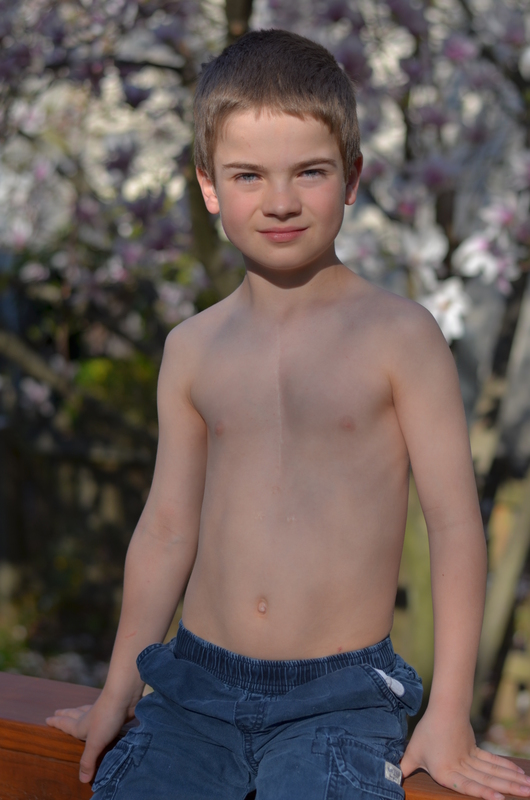 Five years since he faced down his CHD as a four-year-old child. It was a big day for our family. Perhaps akin to celebrating five years of being cancer free for a survivor. Given that it was a date to celebrate, we did just that. We got jumbo crabs, because they’re Corey’s favorite food. I ate four and thought I might explode. He ate three. And three ears of corn. And a giant piece of cake that sported the phrase “Happy 5th Fontanniversary Corey!” in bright red icing (CHD survivor’s color choice – matched fabulously with the sunny yellow & green flowers on the cake). He’s come so far since the days when he would literally eat two bites of hot dog and four green beans for his dinner. Since that day, he has learned to solve the Rubik’s cube. Both the three by three and the two by two. If you ask him to show you, he’ll offer you the cube and ask you to “mess it up” before he shows off his cube-solving prowess. Go ahead and bet him that he can’t do it, but be prepared to part with your money, because he solves it every time. The picture above is him showing off his zipper scar. It’s faded to a fine white line with time, but he still wears it proudly. His badge of courage. And he still wins all the “biggest scar” contests. That’s my smart, amazing, awesome, brazen, funny heart child. I can’t imagine life without him.